Rome (AFP) - Matteo Renzi's time as Italy's prime minister appeared to be over Sunday as exit polls indicated voters had overwhelmingly rejected constitutional reform proposals on which he had staked his future. 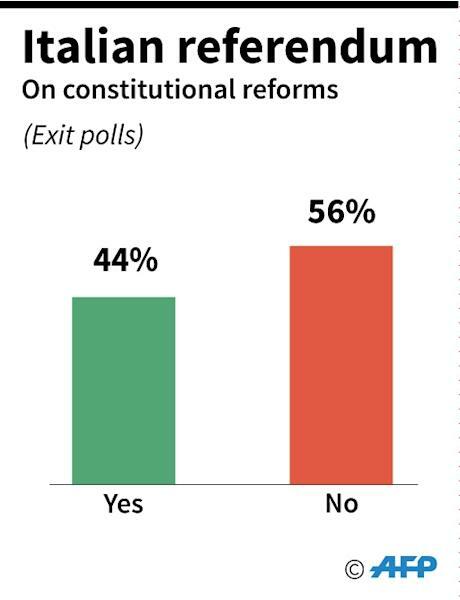 The reformist premier had vowed to quit if he lost the vote on proposals to streamline parliament and the first exit polls indicated he had been left with little other option. Polls for national broadcaster Rai and the La7 television channel both called the vote decisively for the No camp. Their surveys put the winning margin at an average of 56.7 percent to 43.3. 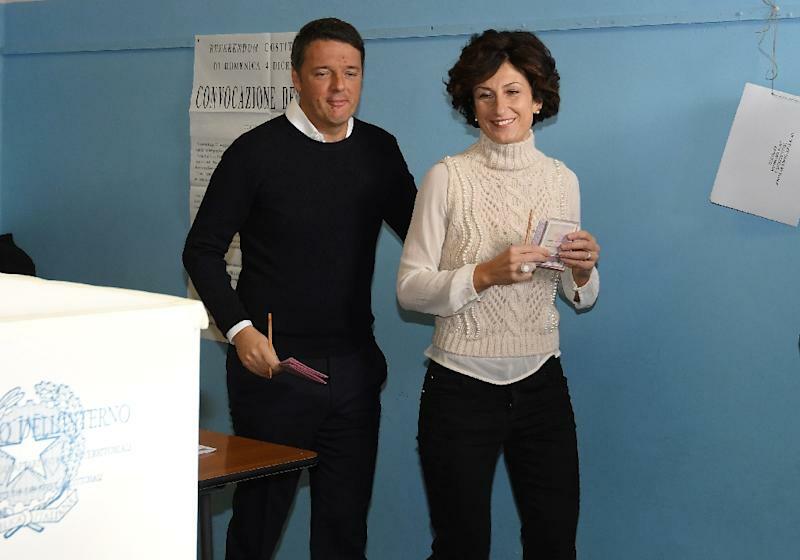 Almost 70 percent of the electorate turned out to vote, first reports from polling stations indicated, underlining the stakes after Renzi's resignation pledge turned the vote into a de facto referendum on his leadership and record. The projected result was in line with what opinion polls had been indicating up until November 18, after which the media were banned from publishing survey results. Renzi was due to make a statement at his Palazzo Chigi official residence around midnight, aides had said prior to the polls closing. The defeat and Renzi's likely departure will plunge Italy in a new phase of political uncertainty and possible economic turmoil. Presuming Renzi does step down, President Sergio Mattarella will be charged with brokering the appointment of a new government to run Italy until the next general election, which has to take place by the spring of 2018. 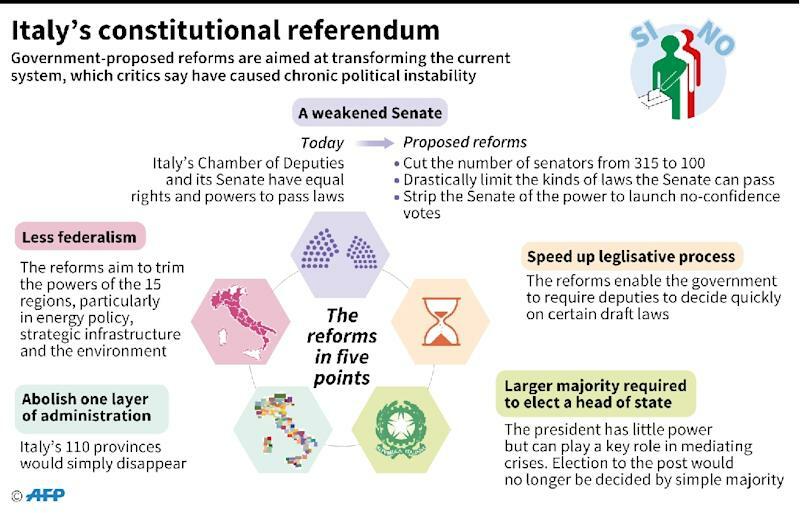 The main opposition parties went into the vote insisting that there should be early elections if the proposals -- curtailing the size and powers of Italy's Senate and transferring powers from regions to the national government -- were defeated. Renzi had gone the final weekend of the campaign insisting he could still win voters around. And during the day his hopes were raised as turnout in the prosperous north of the country far exceeded that in the south -- a pattern which was seen as a potential boost to the premier's survival hopes. But it appeared in the end that voters on both sides were equally energised, leaving the balance of forces much as it had been at the start of the campaign. Opposition parties denounced the proposed amendments to the 68-year-old constitution as dangerous for democracy because they would have removed important checks and balances on executive power. Spearheaded by the populist Five Star Movement, the biggest rival to Renzi's Democratic party, the "No" campaign also capitalised on Renzi's declining popularity, a sluggish economy and the problems caused by tens of thousands of migrants arriving in Italy from Africa. Matteo Salvini, leader of the far-right Northern League said Renzi should resign immediately and called for early elections. "God willing it's over. A new era starts tomorrow I hope," he had said earlier in the day. The No vote represents a major victory for Five Star leader Beppe Grillo, who had urged Italians to follow their gut instincts. But Renzi's backers believed they were voting for overdue change. Some short-term market turbulence looks inevitable in the wake of the vote. And some analysts fear a deeper crisis of investor confidence that could derail a rescue scheme for Italy's most indebted banks, triggering a wider financial crisis across the eurozone.